Work breakdown structure involves the decomposition of major project deliverables into smaller, more manageable components until the deliverables are defined in sufficient detail to support development of project activities. A WBS is a project’s backbone. It contains all the work and only the work that is to be performed on a project. Once you have divided your project into smaller components, you will have a good grip over the project and you will be able effectively plan the scope, time, resources and cost of the project. You can divide your project to any level of WBS but usually it is sufficient to break down a project up to 4th level of WBS. The division of WBS can be with respect to project phases, nature of work or any other reference. For example, construction projects can be divided on the basis of storeys or parts of the structure and they can also be divided with respect to nature of work for example earthworks, structure works, architecture works, MEP works etcetra. Lowest level of WBS contains activities. It is important to understand that activites are not the part of WBS. WBS has a role to organize the activities or you can say that WBS acts like a box in which project activities will be placed. This is a project title which is construction of a 2 storey building. We can divide this project in to Foundations, Ground Floor, First Floor and Roof which is our 1st level of WBS. Then we can divide these elements further according to nature of work for example we can divide foundations in earthworks and structure works. We can divide ground floor in to structure works, architecture works, electrical works and mechanical & plumbing works. Similarly, we can also divide first floor and roof. This will make 2nd level of WBS. We can sub divide them further if it is needed. Now we can place activities in our lowest level of WBS. WBS elements which contain activities are also called work packages. So in this example, our WBS level 2 contains the work packages. WBS is used to plan scope, time, resources and cost of the project. It is easy to plan a component of a project rather than planning a project as a whole. Your estimates will be more accurate and you will be more confident about your planning. WBS is used to organize activities of a project. Projects have a large number of activities. It is important to organize them so that they are easily accessible and also we can communicate about activities better if they are well organized. For example if I have to update brickwork on lets say 10th storey of a 15 storey building in my schedule then it is difficult to find this particular activity if they are not organized. WBS is used to view combined data of activities. This means that you can summarize your data at any WBS level. This data can be with respect to duration, cost or resources. For example you may want to see what is the total duration of all earthworks in your schedule or you may want to see what is the total or actual cost of all electrical works of you project. You can easily see this required information if you have elements of earthworks and electrical works in your WBS. Similarly, this summarizing of data will enable you to monitor, control and report at any WBS level. 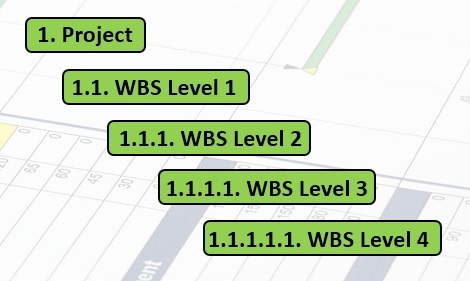 WBS is also used to control access within a project. For example you may need that all mechanical activities of a building project should be monitored by a mechanical staff person. Or you may have a subcontractor on your project and you want Them to monitor their scope of work. In these cases, you can assign a user to specific WBS of the project. For further details and more interesting concepts, checkout our ‘Project Management with Primavera P6′ online training course‘.